As the outsized iPhone growth of the past few years fades, investors are turning their heads to Apple Services. Moving the App Store’s focus from a pure search platform to driving discovery and better monetization is key for the Cupertino, CA-based tech giant to succeed in the coming years. Over the last two days, Apple shares fell by 7%, shaving $60bn off the market cap of the most valuable company on Earth . Investors were spooked earlier this week by the announcement that Taiwan Semiconductor Manufacturing, one of the iPhone’s key suppliers, was seeing lower demand for smartphones. Ever since the release of the iPhone in 2007 investors have focused on predicting sales of iPhones in order to come up with their valuation of Apple. The methodology was supported by the fact that, in the last 5 years, 86% of Apple’s revenue growth has come from the iPhone . 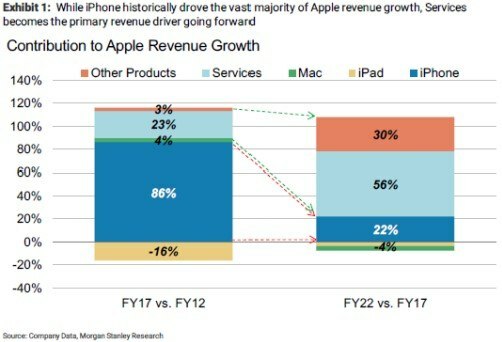 Furthermore, the iPhone has consistently accounted for two thirds of overall revenues . Therefore, lower forecasts for iPhone sales significantly impact the revenue outlook of the tech giant and have provoked a lowering of performance forecasts by Wall Street. The trend does not come as a surprise to most. The sales growth of the iPhone, and of other devices in general, is expected to slow down in the coming future. Replacement cycles are extending due to better product quality, a maturing penetration of the market, and lower subsidies by carriers. In light of this, ten years after the release of the iPhone the market is starting to turn its head towards another revenue stream of Apple: Services. Apple Services includes subscription services such as fast-growing Apple Music, iCloud and Apple Pay. Almost 40% of Services revenues however come from the App Store. Apple, a company that has for long defied the mantra of “hardware being commoditized”, is now realizing that future growth opportunities and its competitive advantage might lie in a platform play, rather than in its products. Executives in Cupertino, CA are therefore focusing more and more on the fast growth of Apple Services on earnings calls . Investors are predicting growth to come mostly from that source in the next five years , with services also expected to drive margin expansion in Apple’s financials. 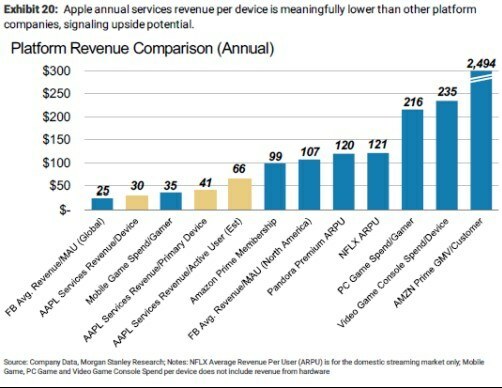 The growth potential of services is huge for Apple. Current average revenue per user stands at $30 per year. If we consider that many users are already spending $99 on an Amazon Prime yearly subscription and upwards of $120 on Netflix, and that only 240 million users are currently active paying users of the App Store (which implies a mere 18% of Apple’s installed base), Apple has significant room to increase the monetization of its main platform, the App Store. The App Store was launched in 2008 with 500 apps. It is well known that Apple’s founder and CEO at that time, Steve Jobs, was reticent to open the ecosystem to third-party developers. Yet ten years later, the App Store holds over two million apps, the lion’s share of them developed by third-party providers. Since its launch in 2008, users have downloaded apps more than 180 billion times in the over 1.3 billion devices that comprise Apple’s installed base (including 700m iPhones). iOS developers have earned over $86b as a result. Following Stratechery’s founder Ben Thompson’s theory, the App Store shares the essential traits of an aggregator: 1) it owns the end user relationship; 2) it incurs zero marginal costs in serving an additional user, and 3) suppliers, i.e. app developers, continually work in improving supply in response to greater demand from the user base . Apple monetizes their app platform in three different ways. First, developers have to subscribe to Apple’s Developer Program for $99/year, which gives them access to the iOS Software Development Kit. Second, the Company charges developers a commission of 30% on app revenues, reduced to 15% if revenues come from a subscription service like Netflix. Third, Apple announced in 2016 its Search Ads program, a Google-style ad service for developers wanting to surface their apps on the App Store. 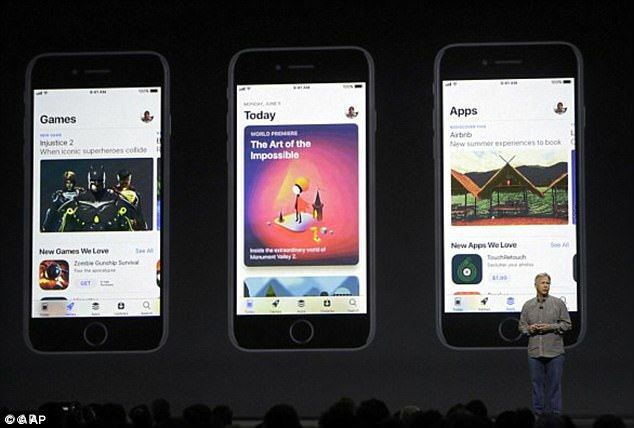 In line with the introduction of Search Ads, Apple has been focusing resources on redesigning the business model and strategy for the App Store. The Company created more value for developers in 2016 by shortening app review times, down from several days to 90% of apps reviewed within 48 hours. 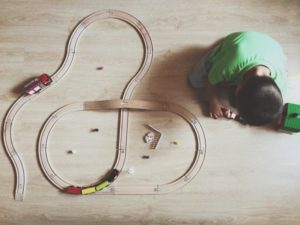 They also allowed for new forms of monetization, such as subscription services, which enable developers to have a closer relationship with the customer and capture more value from them . Signaling further changes down the line, in 2017 Apple provided developers also with better analytics to understand user engagement and returns on marketing campaigns . App creators could also reply to reviews , which meant Apple ceding some control of the user relationship to their suppliers. In September 2017, the App Store got a complete redesign in the new iOS 11 version: the platform now included three Featured tabs (Today, Games, and Apps), differentiating between games and apps and pushing towards editorial content and daily highlights . The new design has moved the App Store from a pure search and update platform to a discovery one. And discovery is key for the Company’s next phase. Apple wants users to become more active in their discovery processes, and thus spend more on the platform. Currently, over half a billion users visit the app store every week. Only a portion of those visitors actually purchase new games or apps. By trying to surface new content, Apple creates value for users (by increasing the functionality of their devices with, for example, new AR-enabled or Siri-integrated apps), helps developers to better monetize their investment, and may increase its own revenues through new app purchases. So far, the change in strategy has paid off for app developers. 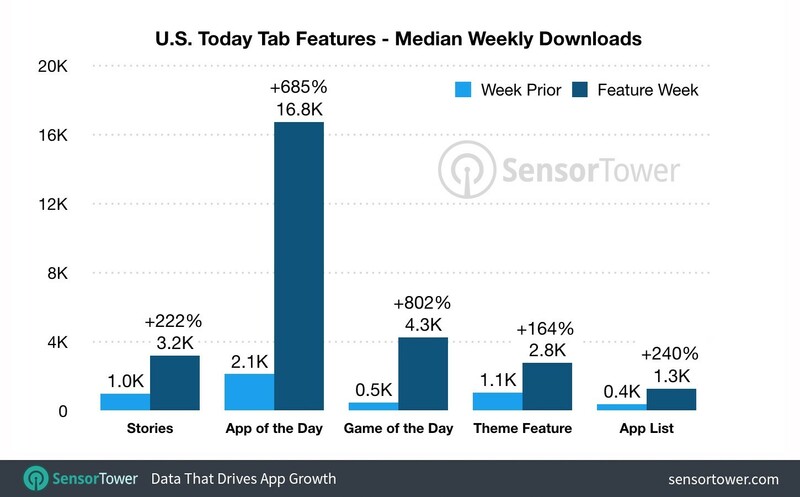 Featured apps and games of the day are experiencing almost 8 and 9 times more downloads compared to the week prior of them being featured . Apple is also making sure that featured apps are balanced in terms of the size of their developers, with 29% of the featured publishers being small developers . The change in strategy entails risks and comes at a cost for Apple. Almost 80% of the App Store revenues come from games, some of which are subscription services. Thus, Apple now has to learn, together with app developers, to better manage churn of subscribers to increase their lifetime value. Furthermore, the push for editorial content implies that they need to curate and craft relevant stories for their billion users, which implies building new regional teams of content creators. While that seems like a straightforward proposition, Apple’s worthy obsession for data privacy might make it difficult for the tech giant to deliver on relevance to their users. Currently, the curation of the Today, Games and Apps tabs is based on regional relevance, e.g. 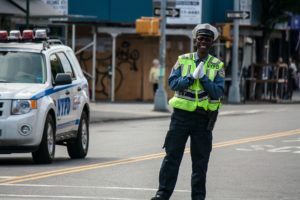 in the US one of last week’s featured stories dealt with tax filing, due to the approaching deadline for the tax season. But one could argue that Apple can deliver more value to customers by targeting apps based on users’ attributes and purchase history. In the meantime, monitoring relevant events and cementing close relationships with developers with high revenue potential remain key for Apple’s move from product to platform. In the long term, Apple will need to worry about small developers being priced out of Search Ads, competition coming from the Android platform, and the evolving relationship between developers and iPhone users. Expanding these trends to other App Stores beyond iPhone’s, such as the Mac App Store, is also a low-hanging fruit for the Company. We must also consider Apple’s play in the voice assistant space, with the recent launch of the HomePod. Expanding the functionality of apps to the HomePod will be key to maintaining the seamless integration among devices that drives users to buy into Apple’s ecosystem. In summary, the pace of the transition to more stable and recurring revenues from Services will be one of the key elements to Apple’s stock performance in the coming future. As growth from device sales declines, the App Store must keep up with its growth pace to deliver total growth year on year for Apple. Transitions, even if for one of the major winners of the digital revolution, can be painful. But a greater share of revenues coming from Services should be overall good news for a Company that has experienced outsized quarterly pressure from investors in the past. “The Emerging Power of Apple Services”, by Katy L. Huberty. Morgan Stanley, 03/22/2018. Next Submission	BCG: Disrupted by People Analytics? Great post, Juan! I interned in Product with the App Store this summer, and agree with a lot of the challenges and opportunities you noted. I wanted to touch on Peter’s idea that WeChat is going to come in as a competitor, and respectfully disagree. A big part of Apple’s customer promise is their legitimate commitment to your privacy. That’s a big part of what makes them different from Google or Facebook, and that’s a big unknown for WeChat, especially since it is a foreign company to American consumers who still make up a large part of the App Store’s purchasing base. Google and Facebook’s business models stem from their ability to gather information on you, personalize their products to make it more applicable, and sell that information to advertisers. I imagine WeChat’s is similar. Apple’s business model centers around their App Store and iOS software making the hardware more valuable to the user. It’s the harmony of a user-friendly interface with the user-friendly device. The hardware element is HUGE, and privacy, I believe, is going to continue to be more important to people too. As an American consumer, I don’t have the same trust in WeChat as I do for Apple. I have a longstanding relationship with Apple (I’m on my… fifth iPhone? and my 3rd Mac computer?) so it would take a long time for me to trust another app/hardware brand. And, aside from that, it would be hard for me to trust any standalone app over a company that is controlling both my hardware and software.